Action: Until the end of the phase, treat all Day and all Night cards currently in play as if their text boxes were blank. Then, draw a card. Replaces itself, which is nice. Blanks cards like Plague Stone and St Marco which is nicer. But nonetheless a situational card, neutral to boot, and therefore a difficult one to slot into a deck. It won't blank the ones which are immune to non-day/night. Meh. Most of the time this will just read "Draw a card", which is a waste of deck space for 1 cost. It's nice that it's never a straight-up dead card, but it doesn't do enough to be worth it. If it destroyed one of the types of cards (your choice on cast), it would be sweet. You'd probably have to remove the draw a card clause then, but the effect would be worth putting into some decks. Absolutely right - making it even more situational than I first thought. Not a good card at all imo. This is the kind of thematic jank card that I love, it will never make a competitive deck but it may find a home in one of my casual decks. At face value it cancels day/night for a phase then replaces itself. What it can be used for is to make it easier for it to be both day and night at the same time, allowing for a type of deck that most people wouldn't even consider. 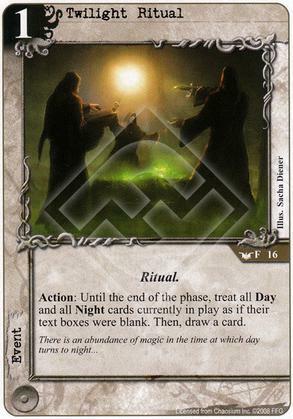 It's also a ritual that draws a card, when combined with silver twilight ritual recursion this forms an expensive draw engine. Even an expensive engine is good when you have domains available at the end of your opponent's turn. This card is a combo piece, by itself it does nothing, and relies on day/night/ritual synergy to do stuff. If we see more support for those mechanics in the future this card may become useful.